One of my favorite shows on television when I was young was Wagon Train starring Ward Bond as the wagon train master and Robert Horton as the scout. I was eleven years old when the show started and used to watch it on a TV set that was in a short wooden cabinet which held a tiny screen the size of an iPad. Black and white shows on a very small TV. Wagons Ho. Each week the episode typically involved an obstacle to smooth passage on the seventeen hundred mile trek from St. Joseph, Missouri to Sacramento, California. Someone was ill or one of the wagons lost a wheel and ran amok hurtling down a steep hill or there was the constant threat of unfriendly Native Americans who for some reason didn’t like the idea of strangers taking over their homelands or constant bickering between the wagon master and his support staff about which way was the safest route for the next day’s journey. Always something, as Roseanne Roseannadanna would say. But that’s not the only dictionary definition of the word pioneer. Webster also says that pioneers are “a person or group that originates or helps open up a new line of thought or activity…”. Not all pioneers rode in covered wagons and not all new territories are limited to land. For some, the goals of a journey involve the search for new lines of thought like equal treatment and fairness regardless of differences, and the distances traveled in personal lives to defend diversity often seem as far as the miles between St. Joseph, Missouri and Sacramento, California. Carole Stoneking was a woman who fits that description of a pioneer. She was born in 1937, a time when the trains and automobiles made covered wagons obsolete. Her birthplace was the motor city: Detroit, Michigan. She loved art and wanted to be a fine artist but was told at a very young age that was an impossible dream – no woman could really be a successful professional artist. She loved women, too, in a time when homosexuality was considered to be a religious abomination as well as a mental illness – not to mention a criminal activity for which she could be thrown in jail. In spite of the dangers involved, Carole announced she was a lesbian in 1956 and began a long-term relationship with another woman in Detroit. She was nineteen years old. (This was thirteen years before the Stonewall Riots which some historians consider to be the birth of the LGBT civil rights movement.) Her family contacted the police to try to have her arrested and removed from her girlfriend’s apartment, but the police advised them that wasn’t possible because she wasn’t being held against her will. The obstacles and adversaries Carole continued to face in her real life as a lesbian for the next sixty years were as difficult for her to overcome as the ones faced by the Wagon Train pioneers, and yet, like them, she persevered. Her lifetime of advocacy for women’s rights and equal rights for the LGBT community began when she came out in 1956 and ended today with her death in Lexington, South Carolina. Carole was proud of her fight for equality and fairness that spanned six decades of sweeping cultural changes, and she embraced the groups that were formed to show “new lines of thought” about homosexuality. 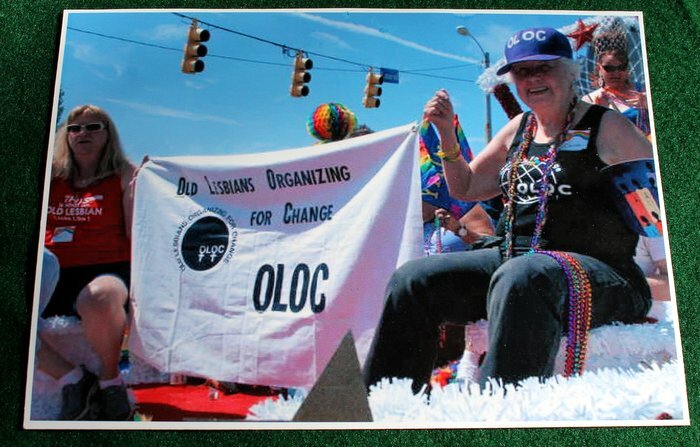 While she never rode in a covered wagon, she also never missed an opportunity to ride on a float in a Pride Parade in Columbia. The final Webster definition of a pioneer is one who “opens or prepares for others to follow.” Every time Carole spoke up for equal treatment, every letter she wrote, every meeting she attended, every march she supported with her presence, every hour she spent recording her history – she was preparing for others to follow…and we have…and we will. When I think of a pioneer today, I will remember a fellow traveler who struggled with the imperfections we all have on a journey we all make – and of a woman who helped to open up new ways of thinking not just for herself but for those who will come after her. This entry was posted in Personal, Reflections and tagged carole stoneking, LGBT community, pioneer, wagon train. Bookmark the permalink. I’m sorry Columbia lost such a stout hearted Amazon. And I’m sorry for your loss, Sheila. She sounds larger than life. May the memory of her courage and outspokenness keep the fire lit for the younger generations of warrior lesbians and gays in South Carolina. Thanks so much, Ann. Carole was one of the 21 people included in my book Committed to Home: Chronicles of the Queer Movement from a Southern Perspective, 1984 – 2014. I can’t remember if I mentioned it to you before, but the University of South Carolina Press is working on the editing even as we speak. I’m so sorry Carole didn’t live to see it in print – she would have been thrilled. All of the others are still with us, and I’m hoping they will be proud of the project when it’s published. You and Carole would have enjoyed talking about your love of art!! Carole was a dear friend and an inspiration. I’m Audrey; my spouse, Maryan has known Carole from their days at the YWCA in Michigan. Mobility issues have prevented us from visiting in recent years. We are hoping to be in SC for a Memorial that we believe is planned later this spring. We would love to read your publication, Committed to Home: Chronicles of the Queer Movement from a Southern Perspective, 1984 – 2014. Carole was so proud to be interviewed and participate. Hello, Audrey and Maryan…so nice to hear from friends of Carole – especially good to hear from someone who knew Carole in the Michigan days. I think her family is hoping to come down for some kind of memorial later, but I don’t know for sure when it will be. I will post on my fb page. I’m sure Carole would have been pleased with her chapter in the Committed to Home book. She was definitely consistently a lifelong advocate for our LGBT community. The book is supposed to come out in 2017 – sounds like a long time away to me – but I will keep everyone posted on my website. Yes, that’s what I hoped for. And thanks for paving the way ….